WHO WERE THE STRANGE ALBINO PEOPLE? I was sent an email by a woman who lives on the end of Long Island New York at Montauk Point. She told me that she often walked her two large dogs on the beach along the Atlantic Ocean coast on the end of Long Island; The woman told me that she often reads my articles and remembered one I wrote years ago about a strange tall very white odd looking family that lived on Long Island in the 1960s. Who Were Those Strange Tall Albino People or Should I Say What Were They? This lady told me that while walking her two large dogs during the months of December and January she witnessed a strange family with a huge strange dog also walking on the beach. She told me they were extremely tall and seemed to be two couples of albinos with about four or five children with them running along the beach as the adults walked the dog. She told me she remembered my article and wanted to know if I had any other reports of this strange family being seen on Long Island. I contacted the woman who told me she stopped seeing the strange group of tall albino people at the end of February. She told me she found them to be so very odd that she asked the people in the town shops and her friends and neighbors if they had seen the group. The only other person who claimed to have seen them was a older man who would feed the birds along the shore on the beach but he only noticed them once and did not recall ever seeing them again. I questioned her and found the woman to be concerned about the people as she felt they were something other than human and felt very uncomfortable when walking near them. She told me her large dogs who were very protective and a bit on the aggressive side would whimper and stick their tales between their legs dragging her away from the group refusing to stay close to the them which ended with her being dragged in a half run down the beach away from the strange group of people by her frightened protective pets. In all the years (50 years since 1965) since my family and I encountered the same type of tall albino looking people this was the first time anyone in my area ever talked about seeing them not only on Long Island but anywhere. Below is the original article I wrote about these strange tall while blue eyed people. I wonder if they are being seen anywhere else in the world and if so who they are and where did they come from and where do they disappear to? The Strange Case of the Albino Family- or Was It? I hadn’t thought about Gertz Department store which had long ago gone out of business for years much less the Albino family. My mother went on about how striking they were and how well dressed and groomed they were. My mother commented many times back when she saw them how beautiful the family was and always noticed what they were wearing. I never thought much about it then as I was in my teens but as my mother went on and on about the Albino family I realized how very strange they really were. The family consisted of two adults and three children. All of them were albinos. I have only seen a few other people who have this albino condition and really did not note the differences in this family and the other albinos I have seen. Talking to my mother about this family I began to realize they were truly unusual people and not like other albinos. The five members of this family all were 6ft in height including the mother and daughter. The male members stood between 6ft –3 inches to 6ft- 5 inches. They were extremely tall people. When they walked through the department store they stood a head above most of the other shoppers. Each of them had thick full pure white hair. They were beautiful people with high cheekbones and straight model like features. Their skin was white – pure white. They all had the same color eyes, which were clear, big, and very light blue. They kept to themselves. They would stay together when they shopped and seemed to be quiet polite people. It wasn’t until years later and I had that conversation with my mother about that family that I realized they were a very different group of people. I thought about the possibility of two beautiful albino people who looked so much alike in height, looks and facial features meeting and marrying. Although this is possible I knew the odds had to be nearly impossible. I then recalled reading an article while in college in the late 1970’s that talked about all the eye problems that went hand and hand with those who were albinos. I also read that eye color for the typical albino runs towards the pinkish reddish tint. I know that there are degrees of the condition which would have a lesser or greater effect on things like eye and skin color (or lack of it) in those who are albinos. I did not read about any who had clear big blue eyes. I tried to find out if there were blue-eyed albinos that could run in an entire family but came up empty handed in my search. I am not qualified to answer the question to the chance of this happening but feel at best it would be a very rare occurrence. I thought about this family and had to admit that finding two tall beautiful blue-eyed albinos who married and had three tall beautiful blue-eyed children was either an incredible happening or they were not a family of albinos! Years after discussing this family with my mother I came across a few articles on the Inter net that talked aboutthe tall whites. 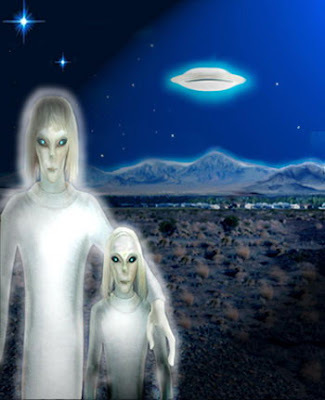 I was scrolling down one of the pages of the site I was looking at when I came to an artists drawing of the alien species called the tall whites. I was completely taken back as I sat and looked at the same tall people with the same beautiful faces – white hair, blue eyes and high cheek bones as the albino family that use to shop for their clothes and house wares in Gertz department store in Bay Shore , Long Island , New York in the 1960’s. I will never know if that strange gentle family of tall beautiful people was simply a very rare family of human albinos or if they were a group of entirely different beings? I often wondered over the past years about that family or group of people. I have tried to search for them a few times but cannot find anything anywhere that would explain this odd group of people. Maybe they just moved away to another state- or planet! I did learn to not be so ambivalent about things and pay attention to people and my surroundings far more than I once did. I wish I had been more curious at the time. I wish I considered how odd those people were and thought about things instead of just blindly skipping along without considering what was going on around me. I learned many lessons during my life. Being alert to my surrounding can be the most important thing I can do for my safety and that of my family. I will tell you one thing, if I ever see a group of tall white aliens again with those huge light blue eyes- I am going to pay attention!